Public Works logic: Could support for Vision Zero mean zero bike lanes on Bloor? When Toronto’s Public Works and Infrastructure Committee (PWIC) met last week to debate a pilot bike lane on Bloor St., it was no surprise that many residents and businesses attended to express their support. 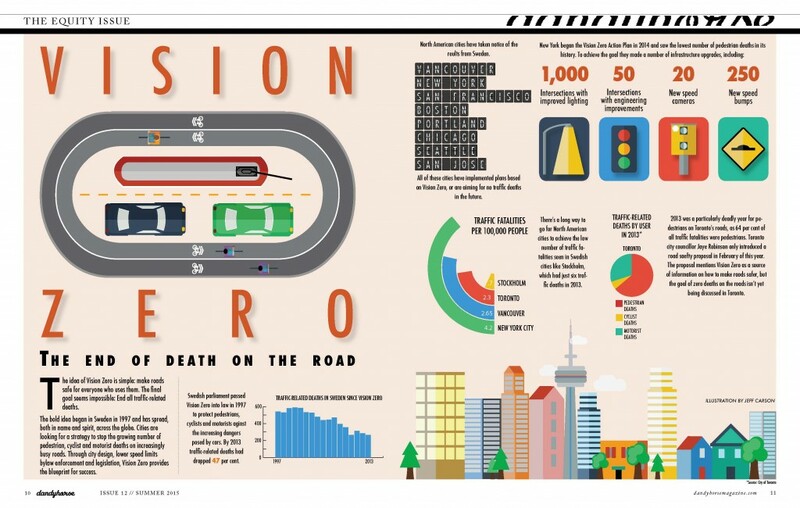 The surprise was that Council’s PWIC chair, who is also spearheading Toronto’s road safety strategy, modelled on Vision Zero, voted against the pilot despite its modest 2.4 km length (on a 5,500-km road system) and its safety objectives. As a result, the pilot has now been punted to the full council for debate and decision this upcoming Wednesday, May 4, 2016. The goal of the Bloor pilot, according to Transportation Services Manager Steven Buckley, is to provide a safe, designated space for cyclists while assessing the impacts on all road users. Although Bloor is a popular cycling route, it has a high number of collisions involving cyclists. In the proposed pilot stretch of Bloor alone, there are 22 cycling collisions each year. Bike lanes are an obvious safety measure while a pilot is a valuable planning tool that provides real world observations prior to a final decision. In rejecting the pilot Robinson explained that, “I support bike lanes but only where and when they make sense.” The councillor ignored pleas to approve the pilot from more than two dozen speakers, including merchants, students, parents, and leaders of cultural organizations and residents’ associations. (A video presented to PWIC, along with a great number of emails, delivered the same message.) Both the Annex and Koreatown Business Improvement Areas (BIAs) support the pilot and have already begun collecting data for a detailed study of the economic costs and benefits. Parkdale Collegiate student Dale Atlas-Jones said that, “having a bike lane on Bloor St. would give peace of mind to both parents and students who want to have a safer, more efficient way to get to school.” Ron Koperdraad of the Bloor Hot Docs Cinema, who suspects he loses business because some cyclists by-pass Bloor for safer roads, welcomes bike lanes for his patrons. And Michelle Stafford of Secrets from Your Sister “passionately supports” bike lanes on Bloor for the safety of her cycling customers and staff. The lone business naysayer at the public meeting scoffed at the notion that cyclists contribute to his enterprise. He was quickly corrected on social media by his many cycling patrons, as well as by PWIC member, councillor Mary-Margaret McMahon, a cyclist and shopper at his store. The owner later issued a clarification saying he welcomed the pilot and would embrace bike lanes if the pilot succeeded. But if Bloor isn’t safe, why do cyclists continue to ride there? The answer is simple … just ask a motorist. Bloor, which connects with Danforth Ave., is a convenient, streetcar-free, east-west route that provides access to jobs and other downtown destinations. Bloor is itself an attractive destination with many coffee shops, grocery stores, restaurants, gyms, institutions like the Royal Ontario Museum, and schools, including the University of Toronto. Bloor has among the highest cycling numbers in the city, despite the absence of dedicated space for cyclists. The potential for growth in cycling is therefore substantial - an increase that may well come from motorists, many of whom would love to cycle but for the danger. A significant percentage of car trips in Toronto are actually short enough to be cycled. From a safety perspective, the key difference between cyclists and motorists is that the former, like pedestrians, are more vulnerable in collisions because they are not protected by bumpers, air bags, and in-car safety technologies. Robinson attempted to portray her opposition to the pilot on the need for more information even though Buckley assured her the pilot was the most comprehensive of any such cycling project ever undertaken by the city. Robinson alone can’t be blamed for the result at PWIC. Councillor Stephen Holyday, who considers cyclists a “minority compared to the mass volumes of people who need to move,” also voted against the pilot, ensuring the 2-2 stalemate. Holyday was preoccupied with whether there would be any increase in travel times, which, as one speaker informed him, was precisely the purpose of the pilot. The vote by councillor Robinson (and Holyday) does not bode well for residents who are hoping for on-the-ground changes to make roads safe. Fortunately, other city councillors still have an opportunity at this week’s Council meeting to prove that protecting cyclists actually matters, and that the safety of “our most vulnerable road users” is a real priority in Toronto. Albert Koehl is an environmental lawyer, road safety advocate, and a founder of Bells on Bloor. He was an expert member of the Ontario Chief Coroner’s panel for road safety in 2012. Bike Spotting: Do you Shop by Bike? Bike lanes on Bloor on the back burner again? Bike Spotting at Bloor and St. George: Do we need bike lanes on Bloor?